The opening line of J.P. Hartley’s Edwardian based novel ‘The Go Between’ begins with the words, “The past is a foreign country, they do things differently there“. I was mindful of that quotation when I recently spotted a link to a Jazz, culture and poetry blog. The link was named ‘Like…Dreamsville’. My first thoughts were of the ‘Mancini’ composition as played by ‘Grant Green’, ‘Wes Montgomery’ and ‘Pat Martino’ – all evocative renditions of the oh-so-slow groove anthem of that name. As it turned out the site was not about the song but something altogether more ephemeral – the strange world of the 1950’s ‘Beatnik’. That term ‘Beatnik’ has been so successfully parodied that it can never appear less than corny and the establishment of the time delighted in making it so. As a quasi-cultural movement it looked lame and contrived and so it was meant to look. It portrayed the apparent boredom and ingratitude of American youth. A youth in the process of rejecting the ultra-materialistic values of their ‘elders and betters’. I suspect that the term ‘Beatnik’ was eventually allowed to die of embarrassment, as nothing kills a movement quicker than being absorbed into the popular consciousness as a joke. ‘Mr Magoo’ and ‘Gilligan’s Island’ abetted in this (see ‘Like…Dreamsville’). Lurking behind that was the voice of the ‘Beats’ and what the mainstream press were so desperate to undermine was almost certainly the ‘Beat Generation‘. That was another entity entirely. Unlike the ‘Beatniks’, the ‘Beats’ were not a media invention (even though the name was probably ably assisted by the liberal media of the day). The conservative establishment had long felt that a dangerous counter-culture existed in the orbit of Modern Jazz, Modern Art and Modern Poetry/Post War Literature. This was a harder nut to crack, because the gifted writers, musicians, poets, philosophers and artists were perfectly capable of rising to the challenge and turning the ridicule right back on so-called civilised society. I refer to the likes of Kerouac, Burroughs, Ginsberg, Snyder, Corso, Ferlinghetti, Kaufman, Kessy, Baraka, Pollack, Watts and many others. Into this mix add musicians like Lester Young, Dizzy Gillespie, Harry the Hipster, Charlie Ventura, Paul Horn, Chico Hamilton and Charlie Parker. The ‘Beat Generation’ used Jazz as its soundtrack and a lot of the hip vocabulary arose directly out of that music. The new lexicon that arose was later twisted to become a weapon. Like the ‘Hippy’s’ that followed in their wake, the ‘Beats’ danced to different drummers than their straight counterparts. They were more likely to follow the slightly bemused Dr. D.T. Suzuki (Zen Buddhist author), Tang Poet ‘Han Shan’ or Lao Tzu than any home-grown Christian leader. The poets, BeBop and the homeless freight-car hopping pilgrims had an infinitely higher currency than a suburban homebody. This restless generation had open ears, open eyes and they moved to deeper rhythms than the static of suburban life . Finding the ‘beat’ of life was an end in itself. 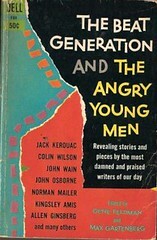 I confess that I was one of the youth who identified with the ‘Beat Generation’ and I am quite unrepentant. More than 50 years on I still identify strongly with their cause. In San Francisco, home of the ‘Beats’, poetry was a real commodity. Signs saying, ‘poets wanted’ could be seen in the windows of Jazz bars. Pokey little book shops like ‘City Lights’ held regular poetry readings and ‘On The Road’ captured the hearts and minds of a footloose generation who looked beyond the material for deeper meaning. This wave of anti-materialism was felt to threaten the post-war security and so the ridiculous hipster alter-ego was created – the ‘Beatnik’. The joke even extended to Gilligan’s Island and Mr Magoo. Do visit the ‘Like…Dreamsville’ site and try to reclaim the best part of that dream; at this distance the laughter is ‘coolsville’. For those who like time travelling read ‘On The Road’ or read ‘Howl’ while listening to 1950’s Miles Davis. Where did the suffix ‘nik’ come from? Probably Sputnik. Did terms like ‘cool’ survive? yes … it is still way cool. Hey man – I’m diggin’ it!